We need a slick marketing landing page fully responsive to desktop, tablet, mobile developed on bootstrap toolkit (only bootstrap - see [login to view URL]). 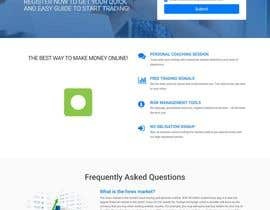 This landing page will promote a forex (finance) service. We drafted a very basic version of it at [login to view URL] but all the content (including all texts, positioning...) can be changed with your own inputs. - Then, the form frame is replaced and then asks for first name, last name, phone number (all the other content of the page remain unchanged). These items are optional and the user can click submit without entering these details. - Once done, the box is changed with a message "Successful registration"
If the user tries to exit the landing page without finishing completing the forms, a pop-up/alert is displayed e.g. "Are you sure? The change you have made may not be saved!" Please provide full package including html(or php)/js/css and graphical materials we can post to our server. All source code correctly formatted with correct indentation. If you create any graphical materials, the Photoshop editable versions must be provided as well. please check my Entry #27, thank you. please check my another entry Entry #28 , thank you. Please check my entry #1 and provide your feedback. Its bootstrap toolkit landing page with full responsive support for mobile, tablet etc. check entry #2 and #3 (mobile view) as well. Thank you for all these entries. I sent you a message. Hello sir, i just wanted to know in the beginning what do you want to submit PSD design or HTML links and which version bootstrap you want 4.0 or 3.7 version we are comfortable in both. Hello, Bootstrap 4.0 is preferred. For the handover, I'll need the full package including html(or php)/js/css source files and graphical materials we can post to our server. I read all of your requirements kindly you contact me via private message I want to see your required examples. Hello, looks like Freelancer prevents me from contacting you directly. Please submit a dummy entry which will allow me to send you a private message and I'll send you all the details.